Axial T2 images show multiple, bilateral, small, linear to ellipsoid, T2 hyper intensities involving Periventricular white matter, corpus callosum, calloso septal groove, brain stem as well as cerebellar white matter. On Sagittal T2 sections most of the lesions are perpendicular to lateral ventricle - Dawson’s finger. 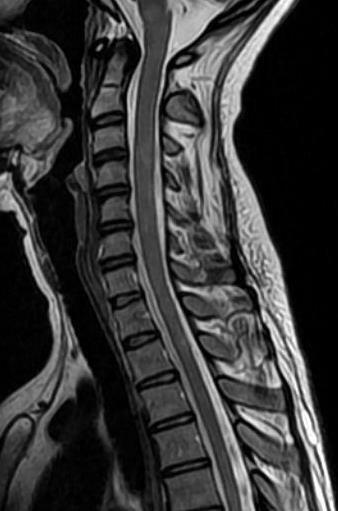 Sagittal T2 screening of Cervical region spine show small faint patchy intra medullary T2 hyper intensities. Imaging wise diagnosis: Plaques of Demyelination – Multiple Sclerosis. A primary demyelinating disease of CNS. An autoimmune mediated demyelination in genetically susceptible individuals. Multiple small (~5-10mm), perpendicular, linear to ellipsoid, T2 hyper intensities involving Periventricular white matter (in ~90%) and calloso septal groove (in ~75%). Involvement of cerebellum and brain stem in ~10%. Multiple patchy small ill defined intra medullary T2 hyperintensity. Most commonly seen in Cervical region cord.